Identitäten, Identitätsbildungsprozesse oder Identifikationsstrategien wurden vor allem an „Barbaren“ des spätantiken und frühmittelalterlichen nachrömischen Europa untersucht. Dieses Buch konzentriert sich auf das Přemyslidische Fürstentum und untersucht, ob die von der Wiener Forschungsgruppe entwickelte Methodologie auch auf das hochmittelalterliche Mitteleuropa anwendbar ist. Im ersten Kapitel werden die Přemyslidenherrschaft und ihr Funktionieren kurz charakterisiert. Im nächsten Schritt wird das Bild dieses Fürstentums und seiner Herrscher und Bewohner, Bohemi, in mittelalterlichen narrativen Quellen, die innerhalb der Grenzen des Heiligen Römischen Reiches verfasst wurden, analysiert, ihre Dynamik untersucht und Haupttrends beschrieben. Diese Vorstellungen von Bohemi werden in jeder schriftlichen Quelle kontextualisiert und mit dem Bild von Bohemi in den im Přemysliden-Fürstentum geschriebenen Chroniken verglichen. Beide Vergleichsebenen ermöglichen es, die Kommunikation zwischen diesen Texten und ihrem beabsichtigten Publikum zu verstehen. Im nächsten Kapitel wird die Kommunikation zwischen dem Přemysliden-Fürstentum und dem Heiligen Römischen Reich auf der Grundlage des St.-Wenzels-Kultes analysiert. Zur Ehre dieses Přemyslidenprinzes († 935) und Landespatrons, der auch außerhalb der Grenzen der Přemyslidenherrschaft verehrt wurde, wurden bis 1150 sieben Legenden verfasst. Analysen konkreter materieller Zeugnisse seines Kultes, besonders seiner Reliquien und der Überlieferung seiner Legenden, bieten einen wertvollen Einblick in die Kommunikationswege zwischen den böhmischen Ländern und dem Rest von Europa. Processes of identification were mostly studied on “barbarians” of late antique and early medieval post-Roman Europe. This book focuses on the polity of medieval inhabitants of Czech lands and examines, if the methodology developed by a Viennese group of scholars is also usable on high medieval central Europe. It shortly introduces and contextualises the beginnings and functioning of the Přemyslid principality in the Czech lands. An important layer of identification is an external image. 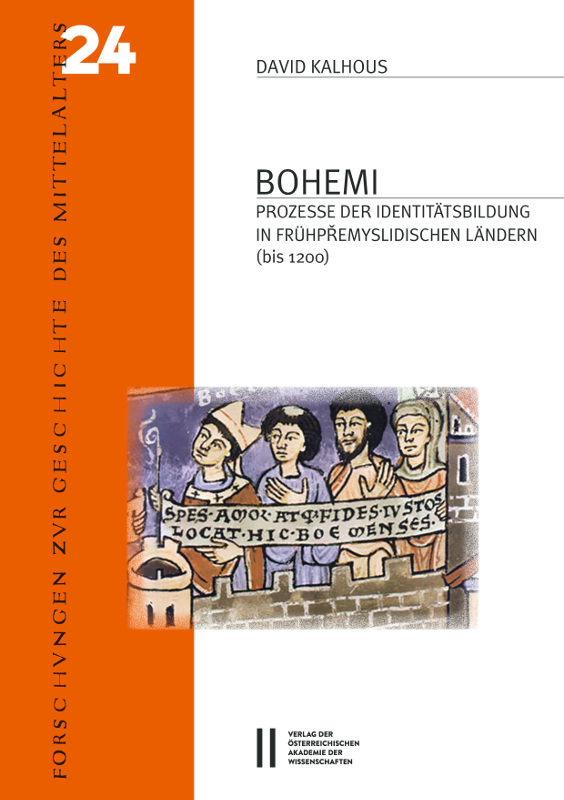 Therefore, the image of that area and of its rulers and inhabitants, Bohemi, in medieval narratives written within the borders of Holy Roman Empire is analysed with the focus on its dynamics and main trends. This imagination of Bohemi is contextualized in each written source and compared with the image of Bohemi in the chronicles written in the Přemyslid principality. Both levels of comparison make it possible to understand the communication between those groups of texts and their intended recipients. In the next chapter, the communication between the Přemyslid principality and the Holy Roman Empire is analysed based on the St.-Wenceslas cult. This Přemyslid prince († 935) and soon patron saint of Bohemi and their principality became hero of seven legends until 1150. As he was also venerated outside the borders of the Přemyslid principality, the analysis of concrete material evidence of his cult offers another insight into the communication channels between the Czech lands and the rest of Europe. It, too, enables to identify especially those regions which had stronger links to the Czech lands and which seemed to be a bridge between them and the Holy Roman Empire. Finally, because historiographical narratives may become a powerful catalyst of self-identification, the author scrutinizes the possible impact of written texts on Bohemian elites. Based on this analysis, three historiographical narratives are observed and their importance for the self-identification of these elites is evaluated.